Senator John McCain, in the middle of treatment by some of the country’s best health professionals, flew across the country to vote on a process that, if successful, will deny that same health care to millions of Americans. The Senate “motion to proceed” passed, with the help of a tie-breaking vote from Vice President Mike Pence, even though neither McCain nor his 49 Republican colleagues who voted for the motion have any idea what is being proceeded to. McConnell cajoled his caucus into beginning a debate without revealing the text of all the bills that will be considered. Whatever the bills are—and there will be several—we can be sure they will not have passed through a single hearing, a single committee markup, and in most cases nobody yet knows what the Congressional Budget Office will say about them. That didn’t stop McCain from giving a long speech right after his vote about how the Senate must return to its procedural norms. The pure absurdity of this situation is largely by design. Senate majority leader Mitch McConnell needs confusion to get an Obamacare repeal over the line: confusion about what’s being voted for, who is supporting what, and what the legislation will do to people. (The House of Representatives is already moving to gut the CBO and replace it with a small agency that will simply aggregate the findings of DC think tanks, many of which are funded by deeply ideological conservative interests.) McConnell also needs to rely on procedural radicalism—this level of chicanery and deceit has never been seen before in the Senate. Constant contradictions and confusion, attacks on authority, and naked power grabs are the hallmarks of the Trump era, and they have many stepchildren: the campaign against “fake news,” which the president has dubbed the “enemy of the American people”; a mushrooming campaign to reduce voting rights under the pretense that millions of illegal votes were cast for Hillary Clinton; and this health-care process, among others. To thwart McConnell and his colleagues in the House, clarity is needed about what his plan really is and how it will proceed. So let’s spell it out. Over the next several days, the Senate will hold several health-care votes, reportedly on the House health-care bill (the AHCA); some version of the Senate health-care bill (the BCRA) with changes pushed by Senator Ted Cruz; a straight repeal vote; and then finally a “skinny repeal” bill—the new term of art for a very pared-down repeal bill that eliminates some of the least popular provisions of the Affordable Care Act. That will probably include eliminating the individual mandate and the medical-device tax, among other provisions, but the details don’t really matter—the goal is just to get anything, a piece of paper, that McConnell can then send to a joint House-Senate conference that will produce final legislation. The series of Senate votes over the next few days, before that happens, will allow vulnerable Republican senators to make a show of voting against various proposals, and claim they opposed such and such cruel repeal plan—but McConnell doesn’t care. He just needs that final “skinny repeal” piece of paper. It will be important in this process to hold Republican senators accountable: They can’t be for it before they were against it. By engaging in this process, they are ultimately buying into whatever the final product is, and that’s true of every senator who voted to proceed on Tuesday. 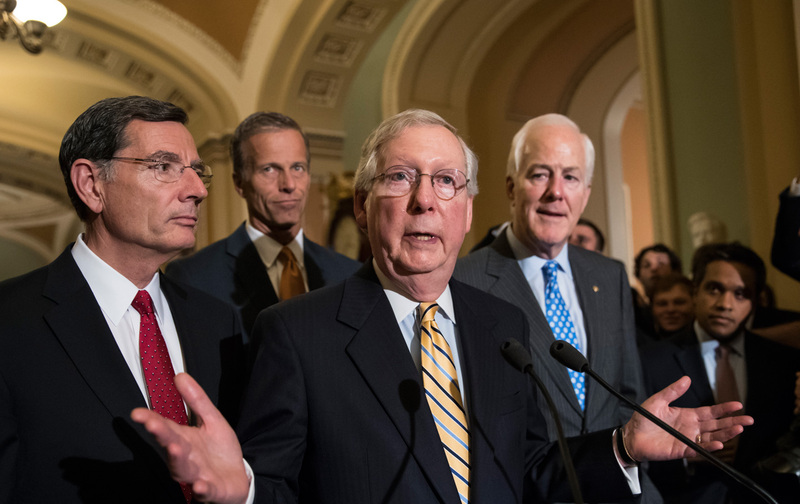 If the Senate manages to pass something, once again there will be massive secrecy. A small group of negotiators will hammer out a bill that will be their best attempt to bridge the divide between what House and Senate Republicans want to see. Once that legislation is produced, it will barrel through Congress—conference reports cannot be amended and only get 10 hours of debate in the Senate. There will be more deliberate confusion about what the bill does, and House Speaker Paul Ryan and McConnell will try to bludgeon their caucuses into supporting it in such a short window that the American people will barely have enough time to understand what’s being passed. The strategy is deeply radical and, in the end, probably unlikely to work—it’s hard to see how the differences in the Republican caucus about the extent to which Medicaid should be cut, and how much of Obamacare should be repealed, can ultimately be bridged. But to defeat it, activists will have to understand exactly what McConnell and Ryan are up to, and they have done their best to keep that obscured.